Browse the latest new homes by Allison Homes nationwide. Based in Bourne, Allison Homes builds new properties in East Anglia and the East Midlands, with starter homes suitable for first-time buyers, to large, executive homes. The housebuilder also has a specialist division, Allison Luxury Homes, which specialises in high-end properties in prime locations across the country. 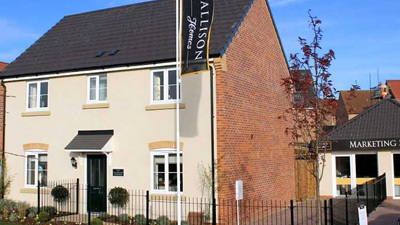 Buyers of Allison Homes properties are able to use the government-backed Help to Buy scheme, and can feel confident in their purchase, knowing that the housebuilder is covered by the Consumer Code for Homebuilders. The company is committed to providing not only quality homes, but quality service throughout the whole house-buying process. Choose a Allison Homes development in this area.